So Out of Shape is about to hit stores! It has already hit some stores: you can get it right now at Readings, and thanks to the lovely people who've tweeted and Facebooked pictures of their spanking new copies! To get a taste of what the book is like, Kill Your Darlings has an extract online now. If you followed or completed my What Dress Size Am I? online survey, this is the bit of the book in which I reveal the results. I even went back to the Bourke Street Mall to subject myself to more judgey glances from shop assistants! That is how committed to my research I am. The official release date is 1 June, and I know for sure it'll soon be available at Booktopia, Constant Reader, Dymocks, Bookworld and Brunswick Street Bookstore. If your local bookshop doesn't stock Out of Shape, please ask them to order it in. I'm kind of hazy about how book distribution works, but one thing I have noticed is that bookstores gauge whether to stock a given book by how many people request it. Ebooks are coming soon, from Kindle, Kobo, iBook and Bookish, plus others including OverDrive. The official ebook release date is 3 June, but it'll be gradually rolling out over the next few days. "I'm sick of all these layers"
Just now, I was grumbling to myself about how annoying it was to arrange my clothes to go to the toilet. "I'm sick of all these layers!" I said. Anyway, it takes a while to arrange these stretchy cotton layers so that they create the smoothest silhouette that most efficiently camouflages my flab. It is annoying to have to rearrange myself every time I go to the loo (says I, sipping from a pint glass of water). But much as the Four Yorkshiremen would have dreamed of living in a corridor (it would have been a palace to them! ), women in the past wore many more layers than me. 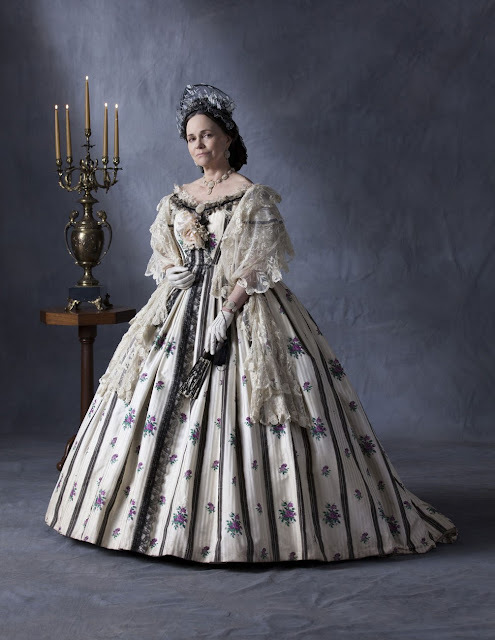 Here's Sally Field as Mary Todd Lincoln in the film Lincoln. In this costume she first donned a shift that went to just above the knee and stockings gartered above the knee. Over that she wore a corset, and then the tail of her shift was tucked – as I discovered last year – into her drawers. Over this she then wore a camisole, then over that her crinoline frame, then over that a petticoat, then over the whole thing, her dress. Sally Field and her costumer could get the whole get-up on in 15 minutes. When I first read that, I wondered why the drawers went over the corset, then I realised that it's much easier to go to the loo if the waistband of your drawers is easily accessible rather than pinned down beneath your corset. Recently I saw the French film Farewell My Queen, set at Versailles in July 1789. Léa Seydoux plays Sidonie, a relatively high-ranking servant whose job is to read to the Queen. For almost the entire film she wears this two-piece silk dress (sometimes with a jacket over the top), but at the end of the film she's humiliatingly stripped naked in front of the Queen. From a costume history perspective I really enjoyed this scene, because I got to see the layers of her costume. She didn't seem to be wearing a separate corset; the bodice of her dress must contain the boning and shaping. She also wasn't wearing drawers, but only stockings, shift, panniers and petticoat. Farewell My Queen is fascinating because of its conceit of being present in the quotidian lives of people two centuries ago. It does a tremendous job of showing them at home in their clothes and surroundings; Sidonie is seen scurrying around the huge château, falling over several times. At one stage she's making out with a hot guy and they are ineffectually trying to remove each other's clothes; it's harder than simply pulling a T-shirt over your head. However, let's not make the mistake of pitying the women of the past for their 'archaic' getup. Much as we do today, they just saw it as normal, and got used to the way their bodies moved and occupied space in their clothes. This story is actually seven years old. It was back in January 2006 that Salon.com investigated the A&F company philosophy (including references to Friendster, LOL!). But the claims were revived in a recent Business Insider interview with retail pundit Robin Lewis. we want to market to cool, good-looking people. We don't market to anyone other than that. … Candidly, we go after the cool kids. We go after the attractive all-American kid with a great attitude and a lot of friends. A lot of people don't belong [in our clothes], and they can't belong. Are we exclusionary? Absolutely. Now some commentators – including Lewis – find this marketing strategy repugnant. At The Huffington Post, Andrea Neusner huffingtoned that as a parent of three "thin, attractive, all-American kids with great attitudes and lots of friends", she was so offended that she was donating their A&F clothes to charity and refusing to purchase more. But A&F is perfectly within its rights as a retailer to define its 'target customer' however it wants. It's not in the business of pleasing everyone. It trades in a kind of sexed-up preppy aesthetic, in which shirtless, wholesome jocks and their girlfriends frolic in an eternally carefree, monied Ivy League youth. Kind of like what Facebook could've been if the Winklevii had had their way. Lots of people seem to have the idea that clothing retailers are somehow conspiratorial in their sizing, deliberately gaming it to exclude those who don't fit the clothes, as it would be a 'bad advertisement' for the brand to let 'undesirable' people wear it. Kind of like jocks and mean girls bullying and ostracising nerds and fat kids. That's just not how it works. Bad experiences with sizing and fit in shops are often the fault of poor customer service and unsympathetic retail design – in other words, the aspects of a clothing brand that have nothing to do with the actual clothes. If Abercrombie & Fitch staff were trained to display a contemptuous, too-cool-for-school attitude and to belittle any shopper they judged to be 'not brand-correct', then that's an issue of customer service. And if the store environment is alienating and intimidating, with shoppers made to feel like supplicants who have to prove themselves worthy to buy the clothes, then that's a store design and visual merchandising issue. A given brand's sizing is actually based on the preferred size of the majority of customers. Any store's 'medium' size is always its bestseller; if a brand notices more 'smalls' or 'larges' being sold, that's a sign that its customer base is changing, and that the sizing needs to be tweaked. While it may seem unfair to those who wear 'outlier' sizes, this is completely not a deliberate psych-out or an intimidatory or exclusionary tactic. And nor is it vanity sizing. It's an effort to streamline the costs of production so the brand is not wasting money making clothes that sit around on racks because they don't fit the average customer. We often hear about how brands are pandering to the expanding market for plus-sizes by offering larger sizes, more cuts and mainstreaming plus-size models. For instance, Swedish fast-fashion brand H&M was recently praised for illustrating its swimwear using a plus-size model. The media often present these actions as the brand's moral choices: choices that acknowledge the dignity and personhood of larger consumers, and that present the retailers as 'good guys'. But for the brand, sizing isn't a goodwill gesture; it's a marketing tactic. And a brand that clearly targets a particular consumer segment, then adjusts its sizing to fit these target shoppers, is making a strategic decision. "Those companies that are in trouble are trying to target everybody: young, old, fat, skinny," Mike Jeffries said back in 2006. "But then you become totally vanilla. You don’t alienate anybody, but you don’t excite anybody, either."